On September 4, 1995, the 28-year-old software developer and entrepreneur Pierre Omidyar launched the famous eBay auction site as an experiment in how a level playing field would affect the efficiency of a marketplace. 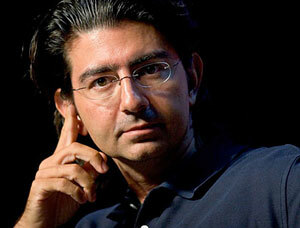 Pierre Morad Omidyar was born on June 21, 1967 in Paris, France, to Iranian immigrant parents, both of whom had been sent by his grandparents to attend university there. The family moved to the US, Washington, D.C. Pierre's graduated with a degree in computer science from Tufts University in 1988. Shortly after, Omidyar went to work for Claris, an Apple Computer subsidiary, where he helped write the vector based drawing application MacDraw. In 1991 Pieere started his career as an entrepreneur, co-founding Ink Development, a pen-based computing startup that was later rebranded as an e-commerce company and renamed eShop. In a long holiday weekend some time in the middle of 1995, Pierre sat down in his living room in San Jose, California, to write the original computer code for what eventually became an internet superbrand—the auction site eBay. Initially, he wanted to call his site echobay, but the name had already been registered. Thus the word eBay was made up on the fly by Omidyar. The site www.ebay.com was launched on Labor Day, 1995, under the more prosaic title of Auction Web, and was hosted on a site, Omidyar had created for information on the ebola virus. The site began with the listing of a single broken laser pointer. Though Pierre had intended the listing to be a test more than a serious offer to sell at auction, he was shocked when soon the item sold for $14.83. Auction Web was later renamed eBay. The service, meant to be a marketplace for the sale of goods and services for individuals, was free at first, but started charging in order to cover internet service provider costs and soon started making profit. What is the profitable Business Model of eBay? It was built on the idea of an online person-to-person trading community on the Internet, using the World Wide Web. Buyers and sellers are brought together in a manner, where sellers are permitted to list items for sale, buyers to bid on items of interest and all eBay users to browse through listed items in a fully automated way. The items are arranged by topics, where each type of auction has its own category. eBay has both streamlined and globalized traditional person-to-person trading, which has traditionally been conducted through such forms as garage sales, collectibles shows, flea markets and more, with their web interface. This facilitates easy exploration for buyers and enables the sellers to immediately list an item for sale within minutes of registering. • When an item is listed on eBay, a nonrefundable Insertion Fee is charged, which ranges between 30 cents and $3.30, depending on the seller's opening bid on the item. • A fee is charged for additional listing options to promote the item, such as highlighted or bold listing. • A Final Value (final sale price) fee is charged at the end of the seller's auction. This fee generally ranges from 1.25% to 5% of the final sale price. This appeared to be an excellent business model. By 1996 the company was large enough to require the skills of a Stanford MBA in Jeffrey Skoll, who came aboard an already profitable ship. Meg Whitman, a Harvard graduate, soon followed as president and CEO, along with a strong business team under whose leadership eBay grew rapidly, branching out from collectibles into nearly every type of market. eBay's vision for success transitioned from one of commerce—buying and selling things—to one of connecting people around the world together. With exponential growth and strong branding, eBay thrived, eclipsing many of the other upstart auction sites that dotted the dot-com bubble. By the time eBay had gone public in 1998, both Omidyar and Skoll were billionaires. In 2009 the net worth of the company reached S$5.5 Billion. Over one million people all over the world now rely on their eBay sales as part of their income.